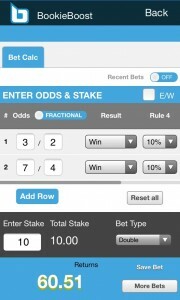 The bet calculator app is useful for calculating your winnings and it also lets you save your recent bet calculations. We like this app for several reasons. First off, it works very well for racing and football on Android and iPhone / iPad. Secondly, there are no annoying adverts like you often get with some of these free bet calculator apps. OK, so after you’ve downloaded the BookieBoost app, open it up and you will see menu choices. The one on the bottom right hand corner is the one to choose for the bet calculator apps: “Bet Tools”. The football acca calculator is really simple to use. Basically enter the odds in either fractional or decimal into each row for the number of outcomes that you require in your acca. You can add more rows or delete them as you wish by pressing the remove or add row buttons. The app also lets you save bet calculations to come back to at a later time. Saved bets are kept at the top of the screen if you set this option. There’s nothing really much more to it. As with the football bet calculator app, the racing calculator lets you save bets, put your odds in either decimal or fractional and all or delete rows. Your saved bets are again stored at the top of the screen should you wish to keep them. 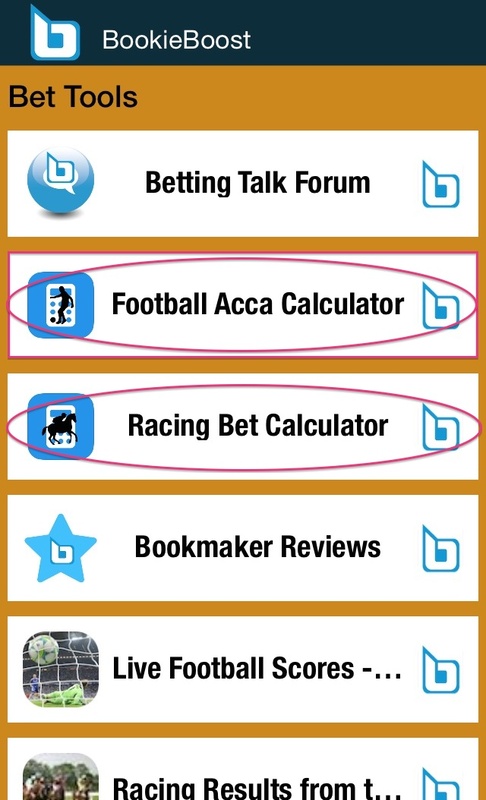 The free bet calculator app for Android and iOS gets the thumbs up for the features identified above. It costs absolutely nothing, has multiple options and gives you more than just a bet calculator app with absolutely zero adverts. Definitely worth checking out the other free bet tools and free bet offers and bookmaker specials on this app, too (especially the football Match Centre).